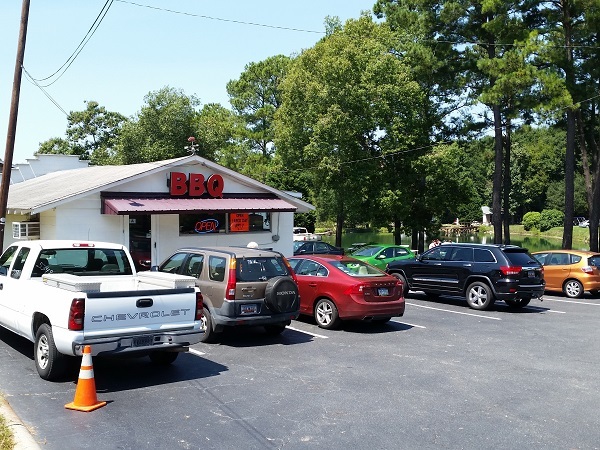 Hite’s BBQ, West Columbia SC – Marie, Let's Eat! A couple of years ago, we visited Jackie Hite’s in Leesville SC and had a really good meal at their buffet. In 1957, another member of that family, cousin John D. Hite, opened a little weekend-only takeout shack about twenty miles closer to town. Hite’s BBQ is just a hop, skip, and a jump from US-1, and, like many restaurants with a lot of hype and a hint of legend about them, it gets really busy during the two days of the week that it’s open. It is still in family hands – John’s grandson David is in charge these days – but the business is still as no-frills as it was almost sixty years ago. My daughter and I were in town to visit the University of South Carolina, and I reasoned that she’d need to know where to get some lunch if she were to go to school here. “Dad, I don’t like barbecue as much as you do,” she reminded me. Well, then, I’d need to know where to get some lunch if she were go to school here and I would be coming to visit. And there are many barbecue places in Columbia. I’ll have to visit each one to decide which I like the best. I may have to visit each of them many times. Not only does my daughter have only a mild fondness for barbecue, should she come to Columbia, she would be in entirely the wrong sauce region. Mustard sauces rule in the midlands, and cooking the meat in the sauce, or with a gentle brushing of it, is the order of business here, and the girlchild has never liked mustard. As I’d have cause to mention later in the day, we can find mustard-based barbecue sauces all over the Atlanta area, but they’re in squeeze bottles on the table. It’s a whole different experience when the pork has been cooked pre-sauced. It is not, to be certain, my favorite variety, but I do enjoy it. I was less taken with the hash and rice here. To the restaurant’s credit, they give guests a heaping serving of it, but what I received was really watery. I’ll assume I had some bad luck, because I really enjoy hash, and many other writers and hobbyists have praised this place, but it was assuredly not prepared correctly when we visited. The pork was much better. The mustard sauce is very mild and it’s applied quite sparingly for a midlands joint, just enough to punctuate the flavor of the wood-smoked pork and not overwhelm it. I enjoyed this a good deal. Hite’s is a fine place to visit again, but perhaps next time I will stop by on a cooler day. Their picnic tables overlook a small pond, and my daughter enjoyed taking photos from our vantage point. We couldn’t linger too long, though, because we had to get to campus. 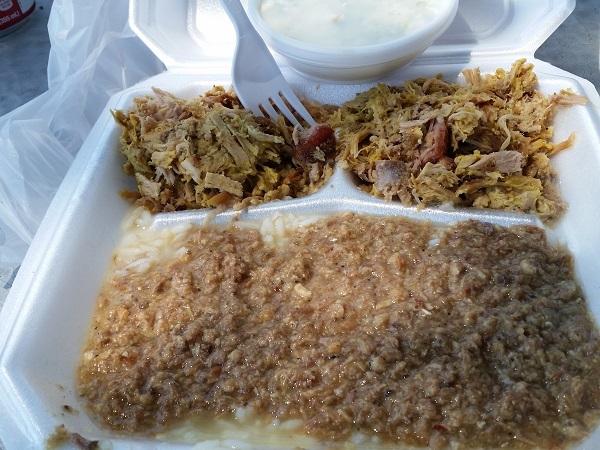 Posted on September 16, 2015 August 23, 2017 by Grant G.Posted in barbecue, columbia, south carolinaTagged barbecue, columbia, hash and rice, mustard sauce, south carolina.